First before the picture a little bit about Wales. Wales looks like a small bump in the middle of England that makes England look pregnant and is roughly the size of um… Wales! The used to have heavy industry in Wales but during the dreadful dark days of Mrs. Thatcher reign she closed all of that. Most of Wales is ‘unspoilt’ a word that is used in England to describe a form of natural dereliction caused by places losing vast numbers of jobs when some evil old cow closes the industries. A lot of Wales is remote and beautiful. So that’s enough, except to tell you that I often used to go to Wales and managed to come back every time. 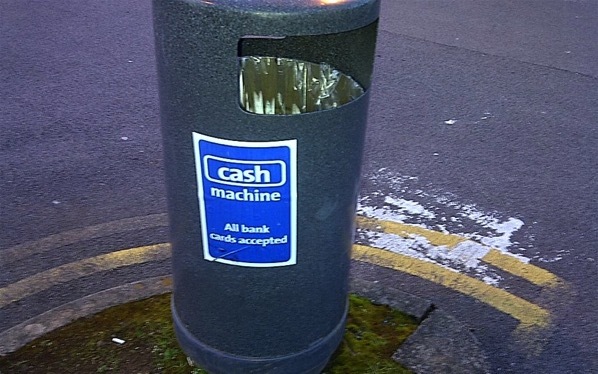 Not all of Wales is backward and forgotten, this for example is a Welsh cash machine! Oh one last thing about Wales, the welsh don’t like people making fun of them… gulp!